Do you remember Louis Orr? 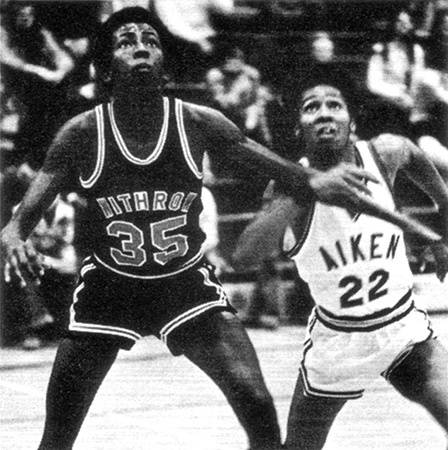 Louis Orr graduated in 1976 and was inducted into the Hall of Fame in 2012. During his three year varsity basketball career with the Tigers, Louis Orr was a force under the basket. A prolific scorer and rebounder, his rebound totals still rank among the top five in Withrow history. As a serior in 1976, he earned MVP honors in the Public High School League and All-City honors by both the Cincinnati Enquier and Cincinnati Post. He was also named MVP of the Cincinnati-Dayton All-Star game, selected for the East-West All-Star game and was named to the AAU all-tournament team. A four year starter at Syracuse University, Orr ranks 17th on the Orange’s career scoring list (1,487) and ninth on the career rebounding chart (881). He was picked the 29th in the 1980 NBA draft by the Indiana Pacers, where he played two seasons, then went on to play six more years with the New York Knicks. Louis Orr came back to Cincinnati after his pro career, and gave back to the community as volunteer coach at Withrow High School for two seasons and at Xavier University for two seasons. He was Pete Gillen’s full-time assistant at Xavier University and Providence College for five seasons. Louis has been head basketball coach at Bowling Green State University since 2007.